Today has been a great day! Our kids woke up giving us lots of anniversary wishes and hugs, I had a great ride on Barney, and then my sweet husband of 13 years today took me to lunch, even though I smelled like sweaty horses and looked pretty grimy! Storms keep coming and going, but we need the rain, so I won't complain. 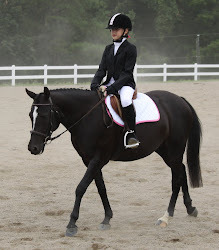 It's supposed to hit 80 on Saturday with sunshine - a summertime horseshow kind of day! Should be fun - wish us luck on our first outing together!